‘Consumers today aren’t looking for cookie-cutter messages from brands. They’re looking to engage with a personalized customer experience’, says Rytis Lauris CEO of Omnisend. What are the main challenges in the digital marketing industry and how to adapt to fast-growing trends? Read our weekly article ‘Startup of the week’ and find out more. So what is Omnisend and how does it work? Omnisend is an omnichannel marketing automation platform built for e-commerce. We’re focused on helping marketers understand their customers better, build stronger relationships with them and generate more revenue. We also help e-commerce marketers save time by providing software that automates their campaigns for them. Our SaaS allows marketers to target their customers with a personalized, relevant message on many different channels, improving their ROI. While there are many email service providers currently on the market, Omnisend stands out because we offer something a little different. While we offer email marketing automation, unlike many ESPs, we allow our marketers to add several channels within the same automation workflow. This means our marketers won’t have to set up separate workflows or bounce between different sites to create a complex marketing campaign. They can do it all from one centralized platform with Omnisend. When we originally launched as Soundest, we recognized the need for an e-commerce exclusive email service provider. Over the course of our growth as Soundest, we realized that our e-commerce marketers needed more. We saw a growing trend in the need for omnichannel marketing automation, and we felt the call to respond to that need. Email marketing is fantastic, but it’s not enough to create a real connection with your customers. We wanted to offer our marketers the opportunity to create a seamless customer experience. We launched in 2014 as Soundest to provide email marketing to SME online merchants. In 2017, we rebranded as Omnisend and became fully focused towards omnichannel marketing automation. There have been a lot of challenges in rebranding, as we’re taking our platform in a totally new direction while still maintaining email marketing at the core of what we do for our customers. But the rebranding has been worth it: we’re able to offer so much more for our marketers. Omnisend is tailored for e-commerce marketers, working in companies that are well-established and are looking for more robust solutions than generic email marketing tools. Our focus is on e-commerce companies that have internal marketing teams. We want to respond to the marketer that’s using Omnisend every day. We serve over 50,000 brands in 130 countries across the world, but our main brands come from English speaking countries, mainly the US, Canada, the UK, and Australia. The biggest challenge anyone working in the digital marketing industry has is keeping up. Digital marketing is changing so quickly and evolving at a pace that no one really anticipated. It’s a full-time job just to be aware of the newest thing, especially when that newest thing becomes obsolete within a day. We combat this by making our product more sophisticated. We’re currently developing AI and Machine Learning algorithms that will soon be able to use predictive marketing. We aim to make our marketers’ lives easier, and creating better automation with these new technologies is how we want to achieve that. We were initially funded by our founders, and we’ve been successful and self-sustainable for the last few years. Our investors are the customers that use Omnisend every day and continue to pay us to invest in making their marketing more relevant. At this time, we’re not currently planning to raise external funding. Rytis Lauris is our Co-Founder, CEO, and the face behind Omnisend. Our core team includes Justas Kriukas, who is Co-Founder and Head of Product, Žygimantas Stauga, our CTO, and Rimantė Ribačiauskaitė, our COO. From there, we’re divided into four main teams that work side by side: Product, Marketing and Sales, Development, and Customer Operations. 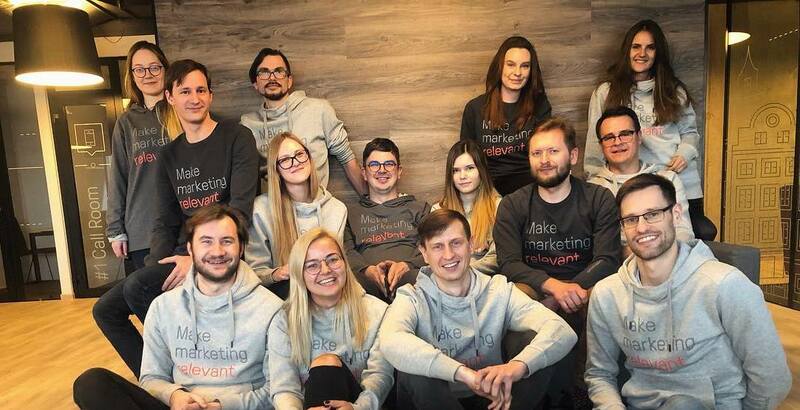 Each of our team members is incredibly valuable to us, and make Omnisend as great as it is, both in product and work environment. We wouldn’t be where we are without them. We have over 50,000 active online stores, and we experience solid growth in terms of revenue every year. After moving from smaller e-commerce businesses to more established stores, we’re aiming to accelerate this, as we’ve noticed larger companies being a longer customer lifetime value for us. Last year we reached a 1 million Euro turnover. This year, our goals are more ambitious: we plan to double or triple that amount. Overall, we’ve grown 10 times in the last 5 years in terms of revenue. The future looks bright for us, as the first few months of 2019 were much better than the same time last year. As previously mentioned, we’re currently developing Machine Learning and AI algorithms to make marketing automation even smarter for our customers. These algorithms will actually help our users to personalize their content and offers for their customers at the right time and through the right channel. Marketers will have to put very little effort on their own since the algorithms will do that for them, i.e. the algorithm will suggest, what kind of campaign the marketer send and the recommendation of products will be generated for every customer personally. We see this as the future of omnichannel marketing automation, and we’re excited to be at the forefront of it. From here, the only place we can go is up..
We also don’t plan on slowing down anytime soon. With offices in Vilnius and London, we’re planning on opening our third office in the US in 2020. We want to extend our reach and attract the best talent that can help us reach our goals, and we think this move will be a good fit for us.